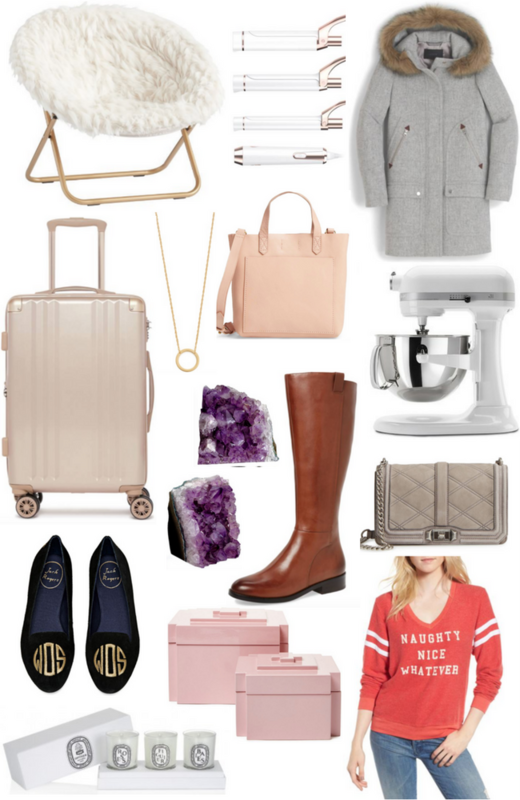 I'm so excited to be sharing the first gift guide in my holiday gift guide series! Y'all seemed to love when I did this last year, so I'm doing it again this year, although slightly different. 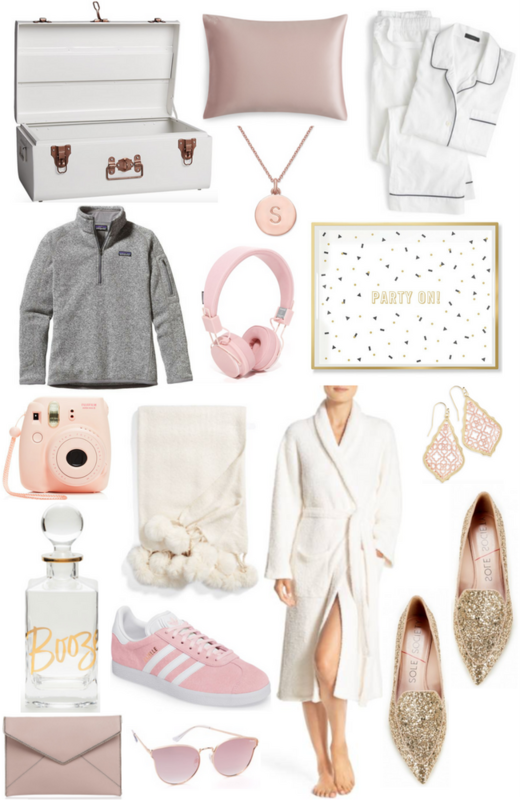 Last year I had a separate gift guide for various budgets in separate posts, however this year I decided to do one post with classic "for her" gifts, and just split them up by budget on the one post. This way all of these gifts are in one place, and you don't have to wait another week or two to see posts for your budget. Hopefully it will work out better with ordering online this way so things also don't sell out! This will be my largest gift guide, but it's also the one that is likely to have things sell out first. This specific guide is for any woman in your life, your mom, sister, bff, roommate, etc. I've gathered a pretty large variety that hopefully covers all categories (although there will be a beauty guide in two weeks, so I've left a number of those items out!). I typically like to shop at stores like Nordstrom and Amazon that have a wide range of items so I can do my shopping in one place, however I also really love Etsy for things that are more unique and personalized! T3 Twirl Trio: If you're looking for a high end set of hair tools, T3 is the way to go! I've heard nothing but great things about this set, and if I was splurging on a gift for myself, this would be what I would get! Parka With Faux Fur Trim Hood: This J.Crew coat has been one of their best sellers for the past few years now and it's back again! It's Italian made, and will definitely keep you warm if you have a harsh winter coming your way! Amethyst Bookends: No matter way you slice it, amethyst is going to be pretty expensive! But if you've got the funds and you know someone who has a thing for the gem, these beautiful bookends are a great gift choice! Monogram Flats: I don't care what you say, monograms will always be in style to me! Monograms are so classic, and I love finding them in unexpected and cute ways. These custom flats are adorable and perfect for someone who also enjoys a good monogram. White 'Vintage' Pajamas: I don't know about you, but pajamas are one of my favorite things to buy for myself and for others! They're so cozy and it's something that no one really thinks to buy for themselves. I love this classic white set that has a kind of vintage feel to them! Patagonia Pullover: I have this pullover and I am obsessed! I use it whenever I go to Lake Tahoe and I also used it when I traveled to Ireland two winters ago. It's the perfect jacket for cold weather that doesn't leave you feeling extremely weighed down. 'Booze' Decanter: This might just be my favorite item on this guide. I'm not sure why but I LOVE the look of this decanter. It's absolutely gorgeous and will look perfect on a bar cart! Gold Glitter Flats: I have a pair of pretty similar looking flats, and constantly get questions on where I got them! Unfortunately the ones I own aren't available anymore, but lucky for y'all I found these. Get these for your glam friend who loves adding a little sparkle to her outfit! Gold Personality Necklace: I talked about why I love these necklaces on Instagram, but I think the concept for this company is so cool! Each necklace has a symbol that represents a personality trait, which means you have the opportunity to create a visual representation of someone's personality. I can be so amazing to see what someone else thinks of you (compassionate, confident, ambitious, etc.) when you might not have thought of it yourself! They also have bracelets if you or the one your gifting to doesn't like necklaces! Pom Pom Slippers: Aren't these the absolute cutest? I got these about a week ago and have been wearing them all around the house, and even once outside the house when I was too lazy to put real shoes on. 😂 I think the pom poms are so fun, and make them a little bit more exciting than your average pair of slippers. Girls Just Wanna Be CEO Tray: This little trinket tray is perfect for the girl boss in your life! She can have it as a mini catch all dish or just a place to display some cute jewelry. And at $10 it's a steal! Hopefully this guide gives you some great items that will help kick off your gift purchasing! It's still early, so all of these items will have plenty of time to ship out before Christmas comes. If you have any specific requests for future guides, I would love to hear your thoughts so I can add extra items to the next guide! Wow, so many options! I think the gold glitter flats are my favorite! This is an amazing gift guide! I love the initial necklace. It's such a simple piece of jewelry. It would be an amazing gift paired with matching pajamas. Also, I'm I love the Patagonia pullover you featured. Can I seriously have one of everything?! LOVE your picks. These are some of my fav guides I've seen so far this season! I love how you broke all these prices down! The T3 wand is on my Christmas list! Obsessed with all of your picks here! Time to get to shopping. I think jewelry is always a fun option for under $100! That and accessories! Loving the pink and rose gold theme here. One of my favourite gifts that I've ever received was my kitchen aid mixer. I love using it! Oh my gosh, SO many beautiful, girly, pink things!! There is definitely at least one gift for everyone on this list! I love the sole society shoes! I really love that you hit all the price points! Much more relatable than most gift guides! I loved the monogram flats the most! 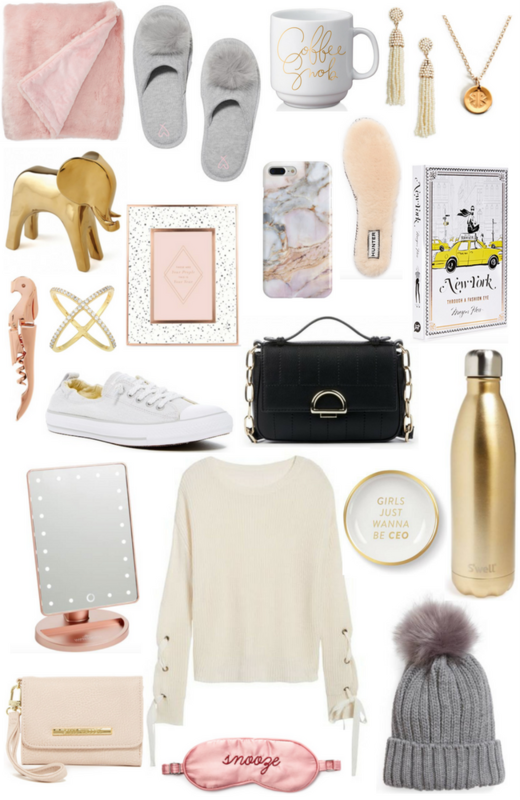 I love ALL of the items in this gift guide. Every one! !